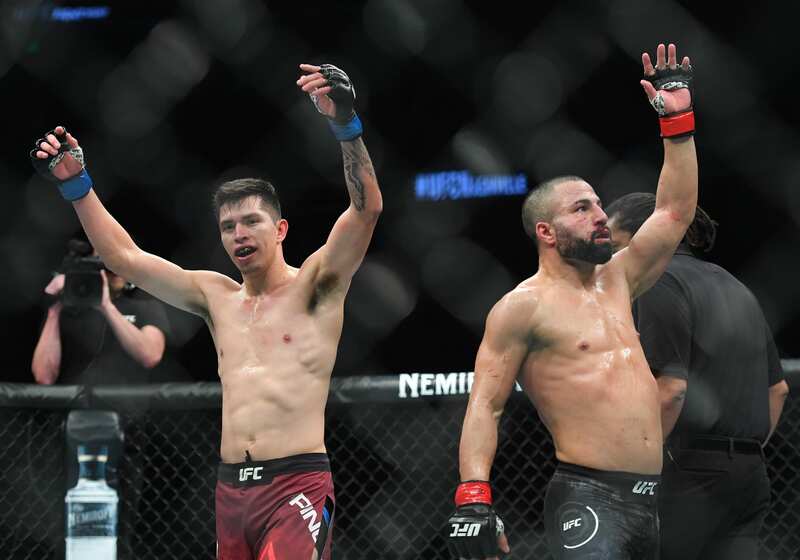 The UFC Nashville main-card continues as John Makdessi meets Jesus Pinedo in an exciting lightweight contest. Makdessi (16-6) has won two straight and three of his last four fights in the Octagon. 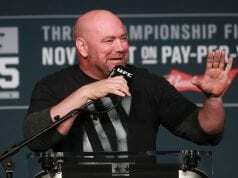 He defeated Ross Pearson via decision in his last outing. As for Pinedo (16-4-1). The 22-year-old Peruvian fighter defeated Devin Powell in his promotional debut last November. Pinedo will make it eight straight with a win in Music City. The fighters touch gloves. Makdessi throws a sidekick in an attempt to find his range. Pinedo is pumping his lead hand for the same reasons. Not much action thus far. Makdessi chops at Pinedo’s legs. The 22-year-old fires back a leg kick of his own. Makdessi closes the distance and both men exchange some punches. Pinedo throws a sidekick as he leaves the pocket. Two minutes left in the round. Makdessi throws a spinning high kick but the young fighter blocks it. The American goes to the body with a hard kick. Both fighters continue to faint as the crowd grows bored. Makdessi chases and lands a leg kick. The round ends. Makdessi takes the center of the Octagon and lands another leg kick. Pinedo slips and gets back to his feet quickly. Makdessi goes right back to the leg kick, Pinedo answers with a straight right hand. This time, Makdessi goes to the body with a hard kick. Pinedo throwing his lead and like a faint. Fairly useless thus far. Makdessi lands another sidekick. He goes to the head but Pinedo blocks it for the most part. They trade leg kicks and Pinedo goes to the head. Makdessi answers with one of his own. Pinedo lands a left hook, right-hand combo. Again, Makdessi lands a leg kick. 45 seconds left and thus far it has been a point fight. Pinedo throws a switch kick but misses the mark. Makdessi catches his kick. Pinedo lands a head kick. The round ends. Both fighters look to have more urgency to start the final round. Makdessi takes the lead and lands another low kick. Pinedo starts to limp. Makdessi goes straight back to the well that has been the leg kick. He switches it up and goes high but Pinedo blocks it. The 22-year-old moves forward and lands a nice one-two followed by a kick. Makdessi throws a spinning back kick but catches air. Pinedo clips Makdessi with a right hand. The crowd begins to boo again. Makdessi lands a nice one-two-one. He catches Pinedo’s kick but the young fighter escapes. A hard body kick by Makdessi. Pinedo starts to talk and lands a hard right hand. He lands a body kick. Makdessi flurries, the round ends.